Word Academy Answers, Cheats and Solutions for iPhone, Android and iPad is an interesting guess game made by Scimob and is available on iTunes and Google Play. Here you have to find the correct word. If you get stuck and need help than use our walkthrough guide to find all the correct answers here at wordacademyanswers.org. Most of us play a word game in order to enrich our vocabulary and at the same time make sure that we known the meaning of as many words as possible. 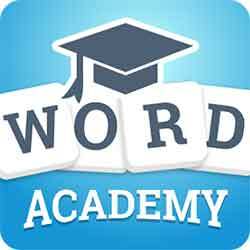 Games such as Word Academy are very popular because not only they allow us to test our knowledge but at the same time we can easily acquire new words and implement them into our vocabulary, all of this being done while playing. Word Academy is a nice word game mainly because it has a highly polished interface and tens of thousands of words that you can play with. You will need to find hidden words in the increasingly large game world, and the best part about it is that each level of the game comes with an order and a theme. The difficulty does increase as you complete levels, but this is exactly what makes Word Academy challenging, the fact that it can take a little while sometimes to develop the necessary skills to move on. What’s fun in Word Academy is the fact that you can always retry the levels for as many times as you see fit, until you complete everything. Starting from scratch can bring in a new approach towards things, and the result is definitely well worth your time. You do have hints that you can use in order to help you, and these are great specifically for those situations in which you feel that you are stuck. The more you play, the larger the game board and the longer the words that you can create here. Thankfully, there are hundreds of levels to play, so you will never get bored as there is a ton of content to go through, and checking it out is just a ton of fun. You do get diplomas when you advance levels, and the game does get even more fun as a result because of that, something that is really cool and exciting to say the least. For many word game lovers, this one is a must because it does offer a challenge, so it doesn’t get boring, instead the more you play, the longer you will stay in front of the board to finish the levels, something you will surely enjoy doing. It’s really cool to see how Word Academy manages to put boredom at bay, and I have to say that the gameplay here is just filled with challenges, so you can rest assured that there is a ton of fun to be had as you play. Graphically, Word Academy is minimalist but it looks really well and it does provide a wide range of interesting graphical fidelity additions. The interface is intuitive, the game boards are professionally created and the title is just a lot of fun. All in all, Word Academy is a wonderful word game with a ton of levels and which also manages to bring in quite a lot of challenge. If you are looking for an interesting game with a nice gameplay mechanic and which has leaderboards so you can always feel challenged, then Word Academy is well worth a try, and we encourage you to download it now, especially since it’s a free game to begin with. © Copyright 2019 All rights reserved Word academy.